strange ones, that people have come up with to restore dying laptops batteries. In this article, I'm going to try to list out all the different ones I've read about. 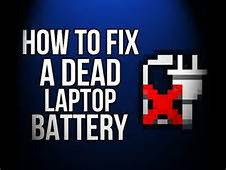 If you have tried to restore a laptop battery yourself, let us know your method in the comments. 1.Take your battery out and place it in a sealed Ziploc or plastic bag. 2. Go ahead and put the bag into your freezer and leave it there for about 12 hours. Some people suggest leaving it for longer, but I wouldn't leave it for more than 24 hours. 3. Once you take it out, remove the plastic bag and let the battery warm up until it reaches room temperature. 4. Reinsert the laptop battery and charge it completely. 5.Once charged, unplug the power and let the battery drain all the way down. Now repeat steps 4 and 5 at least 4 times: charge all the way to full, then discharge completely. That should be it! Unless your battery is leaking acid, you should get some kind of bump in the battery life. Note that you should only perform this on NiCD or NiMH batteries. If you try this on a lithium battery, it'll make the battery life worse. Unfortunately, there is no way to restore a lithium battery. You'll have to find your laptop specs to see what kind of battery you have. For lithium ion batteries, you can't restore, but you can possibly extend the life of a battery. If you have a lithium ion based battery, you can increase it's life by making sure your laptop is cool. If you have a laptop that gets really hot, it can damage the battery and cause the shortness in battery life. I have an old Sony VAIO laptop and I saw a significant increase in laptop battery life when I bought a laptop cooling pad off Amazon. You can get for $20. You may think your battery is on it's last life but it could simply be that it's getting too warm and therefore loses charge faster. With most newer batteries, this is no longer necessary, but if your battery is dying, then it's probably a pretty old battery. In that case, you may benefit from a recalibration. Recalibrating a battery is done because sometimes the operating system cannot figure out how much capacity is left in the battery. computer model + battery calibration. The last option you can try is to let the battery charge to 100% and then simply unplug the computer. When it gets close to dying, i.e. less than 5%, go ahead and plug it in and let it charge up. However, this could reduce battery life on newer lithium ion batteries, so for those batteries it's suggested you only let the battery level drop to 35% to 45% and then charge it back up to 75% to 85%. Sounds crazy, but apparently that will give you the best battery life because it won't use up as many charge and recharge cycles. other methods not mentioned here to increase your laptop battery life? If so, let us know in the comments. Enjoy!